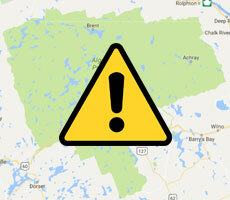 The Friends of Algonquin Park regularly update the map embedded above with current advisory notices for park visitors. Click the icon or shading and to get more information about each notification. These advisories can include road closures, construction updates, campsite or trail closures, boil water orders, water level information and more.